The Avia S-199 was a fighter aircraft built after WWII by the Avia Company, a branch of the enormous Skoda Works in Czechoslovakia. It was built using parts and plans left over from Luftwaffe aircraft production that had taken place in the country during the war. Despite the aircraft’s numerous problems and unpopularity with it’s pilots, it achieved some fame as the first fighter obtained by the Israeli Air Force for use during the 1948 Arab-Israeli War. Czechoslovakian pilots nicknamed it Mesek (“Mule”), while in Israel it was officially know as the Sakeen (“Knife” in Hebrew). In practice, the aircraft was more often called Messerschmitt or Messer (which also means “Knife”, in German and Yiddish). Avia had started building Messerschmitt Bf-109G’s straight after the war under the Avia S-99 name. They soon ran out of the 109’s Daimler-Benz engines after many were destroyed during a warehouse fire. The S-199 continued to use the Bf-109G airframe but, with none of the original engines available, an alternative engine had to be used. It was decided that as a replacement for the original engine, the aircraft would use the same engine (Junkers Jumo 211) and propeller as the Heinkel He-111 bomber. The resulting combination of parts was an aircraft with extremely poor handling qualities. The substitute engine was heavier than, and lacked the responsiveness of, the Daimler-Benz unit. The torque created by the massive paddle-bladed propeller made control difficult. This, in combination with the 109’s narrow-track undercarriage gear, made landings and take-offs extremely hazardous. A final hidden danger lay in the gun synchronization gear, which did not work as it was meant to, leading a few Israeli aircraft to shoot off their own propellers. Around 550 S-199’s were built, including a number of conversion trainers: CS-199 (armed) and CS-210 (unarmed). The first flight took place in March 1947, and production ended in 1949. The last examples were withdrawn from Czechoslovak service (with their National Security Guard) in 1957. Israeli agents negotiated the purchase of Avia S-199’s from the Czechoslovakian government in defiance of an arms embargo that Israel faced at this time. Twenty-five aircraft were obtained, and all but two were eventually delivered. The first examples arrived on May 20, 1948, six days after Israel’s declaration of independence, and five days after the commencement of hostilities by Egypt. They were assembled and sent into combat for the first time on May 29th, attacking the Egyptian Army between Isdud and the current Ad Halom Bridge, south of Tel Aviv. This was the first action of 101 Squadron IAF. In combat, the type proved unreliable and performed poorly. One Avia pilot remarked “She tried to kill us every take-off and landing!”. Furthermore, maintenance problems meant that no more than 5 were typically airworthy at any one time. However, the type scored victories over its opponents, including the Spitfire. The Avia’s were mostly withheld from service by the end of October, at which time only 6 remained operational. The S-199 continued making sporadic sorties through mid-December. American pilot Wayne Peake flipped one on its back on December 15th. The kit is from Hobby Craft of Canada. It is currently out of production. Hobby Craft did two boxing of the S-199 the other kit has a box art of it in Czech markings and that kit can still be found a few places. The kit comes in a shrink wrapped tray and lid type box. 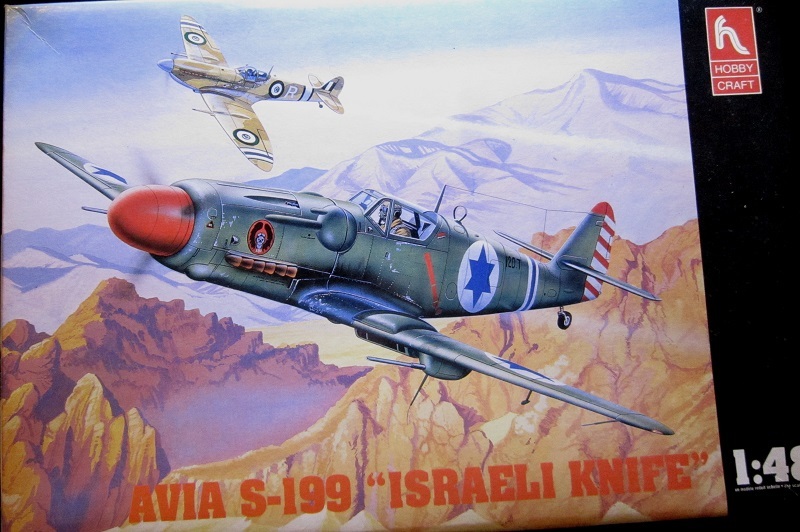 The box art shows a S-199 in an overall dark green (top and bottom), have the Israeli roundels on the fuselage sides and wings and a small black 120-7 in front of a white, blue, white fuselage band.. Tthe rudder has white and blue barber stripes on it. There is a squadron logo on the nose of a winged deaths head wearing goggles on a red circle. It has a red prop spinner. In the back ground there is a late mark Spitfire in a base of sand with green wave pattern camouflage. The tips of its wings have black and white stripes (similar to D.Day ones) It has the fuselage code of a white letter R. Its propeller spinner is all light blue. I am at a loss to identify the roundels on it. They appear to be with a blue center, surrounded in white and then red. The blue center has a white half moon and some stars on it. The tail has a black, white, black stripe on it and there is a fuselage band behind the letter R that is the same three colors. Both of the aircraft are flying over mountainous terrain..
One side panel of the box says the kit was made in South Korea. This is followed by 2 color box arts of other aircraft kits that Hobbycraft markets: a Bf-109G-2 in North Afica scheme (kit no. HC-1538) and a Me-109K-4 “End of the Last” (kit no. HC1539). 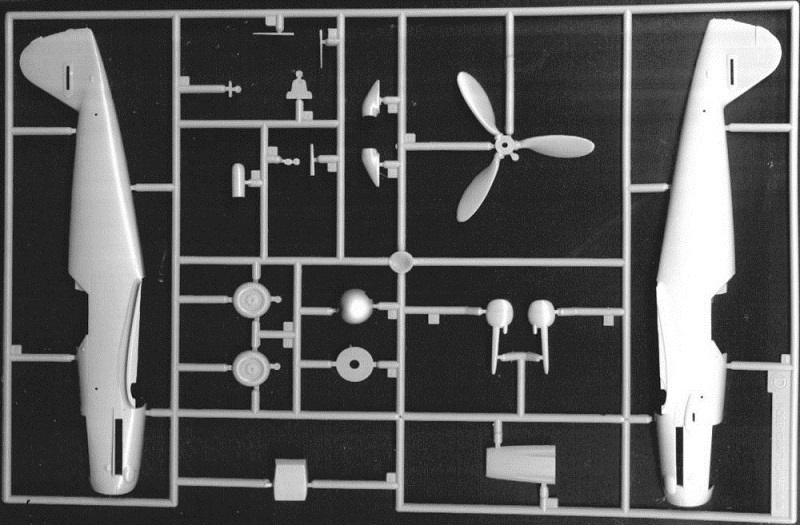 This is followed by a list of the kits features: detailed cockpit and landing gear, engraved panel lines and authentic markings in multiple languages including English. The other side panel has 3 more color box arts: a Bf-109G-6 “Aces Model” (kit no HC1541) and a Bf-109G-14 “Reich Defender” (kit no. HC1544). 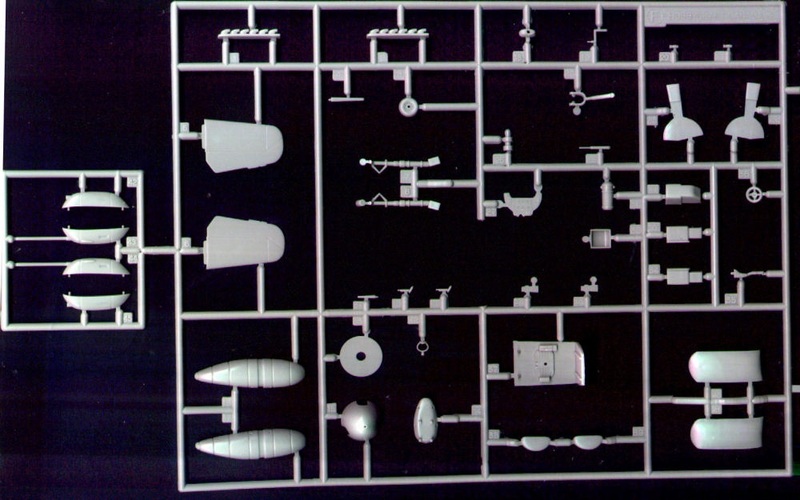 This is followed by the skill level of the kit which is EXPERIENCED and the kit part count of 69 parts. Hobbycraft’s street address in Canada is supplied here also. .Hobby Craft has just about done every mark of the 109 in 1/48th by the way. 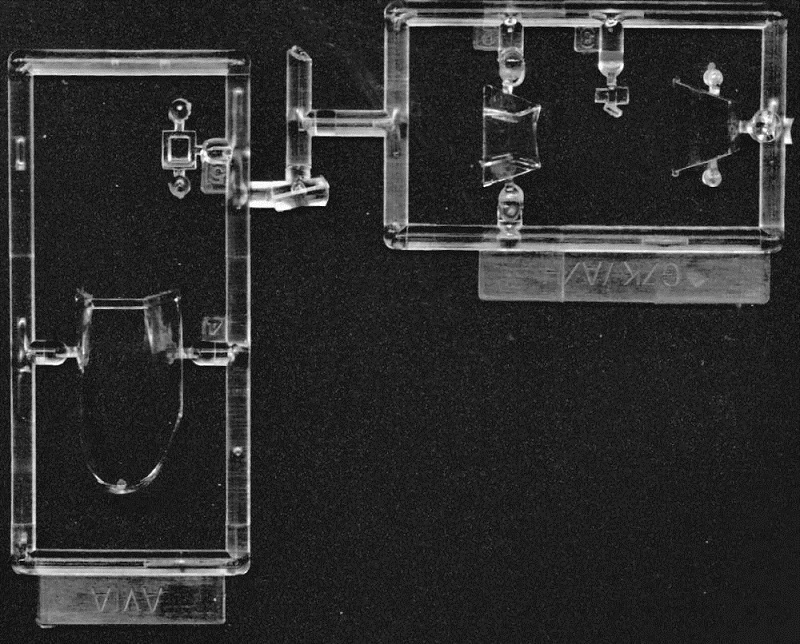 Inside the box is a single cello bag that holds three trees of medium- grey parts and a tree of clear parts. The decal sheet, instructions, a suggestion card (to mail into Hobby Craft with ideas), a catalog ordering blank (printed in English on one side and French on the other) and a slip with “Cautions” on it, in nine languages. The instructions consist of a single large sheet that accordion folds out into six pages in 8 ½” x 10 ½” page format. Page 1 begins with a black and white repeat of the box art. This is followed by “Kit features” in four languages, including English. Next, is a list of paint colors that calls out the Floquil, Humbrol and Testors Modelmaster brands, needed to finish the kit. The bottom of the page has a bunch of international assembly symbols and what they mean. Pages 2 through 4 give a total of seven assembly steps. There are steps where you have to drill holes for things along the way. Step no. 5 asks if you want to use the alternate “flattened” tires in the kit, or the un-flattened ones. There is also an option of two different chin scoops to choose from in step no. 4. In step 6 you can opt for a belly fuel tank or not. The tail wheel can be positioned either extended or compressed and a scrap drawing shows you that the landing gear legs should be set at a 21 degree angle. Pages 5 & 6 have five marking options. Three are in overall RLM 02 grey- green (top and bottoms). One is in a base of grey with dark blue wave pattern and a tan rudder front half. The rear of the rudder has black and white barber stripes on it. The squadron logo of the winged death’s head is on the sides of the cowl and on the forward part of the rudder. A white no. 4 is on the fuselage sides and the Jewish 6 pointed-star insignia on the fuselage sides and the wings. This is aircraft no. 1904 (OTU) Sqdn., ca 1950. The first 3 schemes are all the same They are in overall grey-green with a black and white fuselage band. The first one has a red prop spinner and black and white barber stripes on the rudder. I carries the small black fuselage number of 112-7 in front of the Israili star. This aircraft was flown by Modi Alon, Commander of 101 Sqdn., Tel Aviv, 3 June 1948. The second one is identical except for the small black fuselage number of 120-7 and the winged-skull insignia on the cowling. No unit or pilot mentioned for this one. The third one is identical to the last 2 except no black and white barber stripes on the tail. It carries the small black fuselage number 107-7 It is said to be the aircraft of Pilot Lionel Bloch, 101 Sqdn., 10 July 1948. The fourth one is identical to the third one and has the small black fuselage number of 110-7. The pilot was Eddie Cohen, 101 Sqdn., killed in action 29 May 1948. 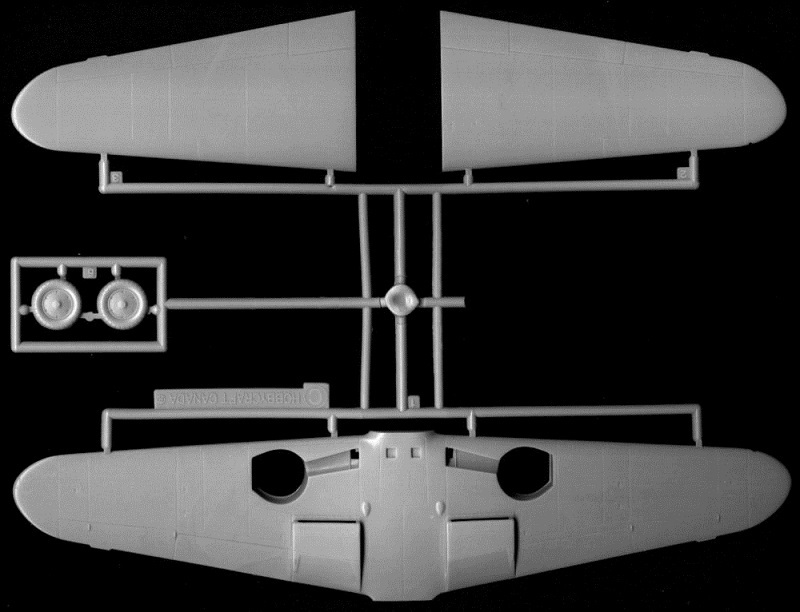 Medium-grey tree letter C holds: the wing halves (the bottom wing is full span), and the main wheels (5 parts). 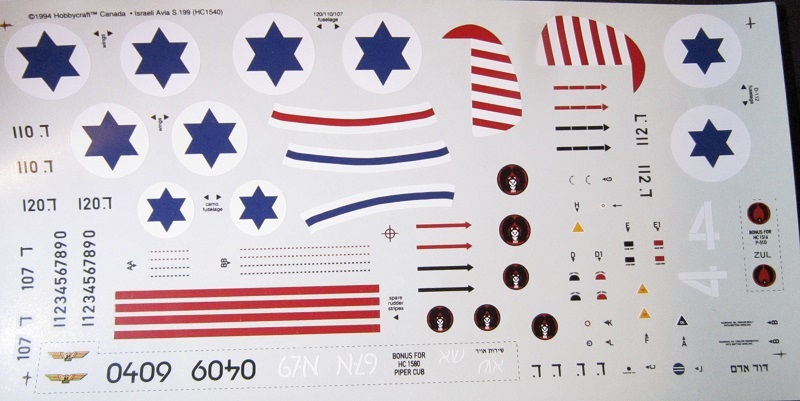 The decal sheet is large and holds the Israeli roundels, the small black fuselage lettering, some stencil markings, rudder stripes, black and white fuselage bands etc. There are a couple BONUS markings on the sheet. Some are for Hobbycraft’s kit no. HC1580 of a Piper Cub and the other is for their kit no. HC1516 of a P-51C.. The sheet has the date 1994 on it, which may be when this model first hit the market. This is a neat subject and one that needs to be included in any collection of Messerschmitt 109 types. Highly recommended. Kit was courtesy of my wallet.